Our 2018 Singapore Conference was held between October 17 to the 19th. It hosted over 90 delegates with approximately 40 guests. Our focus in discussions was centred around the new age of technology. Notaries from across the world came together “Under the Southern Cross” at the 6th Conference of the Australian & New Zealand College of Notaries which was held in Queenstown on the south island of New Zealand from 6th- 8th October. The conference was also attended by numerous experts and speakers not only from Australia and New Zealandbut from other jurisdictions including the UK, Germany and The Netherlands. I was able to bring greetings from the President of the Society and to mention matters of current topical interest to Notaries in England and Wales. I have attended previous conferences organised by the College but in my own opinion, this was the most successful so far and congratulations are due to our fellow Notaries in Australia and New Zealand who staged the event so well. The breathtaking scenery and surroundings of Queenstown were a bonus. The next ANZCN conference is due to take place in 2018 in Osaka, Japan. The Chairman of the Board of Governors, Professor Peter Zablud, added his welcome and highlighted the importance of these events in enhancing and strengthening the collegiate nature of the Notariat. Delegates and guests were honoured by the presence of Her Honour, Sally Thomas, AM, Administrator of the Northern Territory who officially opened the Conference. In her address, Her Honour pointed out that the commonality shared by the theme of this year’s Conference, Crocodiles, Pearls and Notaries, was “their uniqueness and immense value”. Her Honour graciously accepted an framed medallion with brass plaque from the College presented by the Conference Chairman, Joseph Lukaitis. Following, delegates and guests were also addressed at the opening of the Conference by occasional speaker, Mr Simon Cariss, who spoke on “The Office of the Future”. The formal opening was followed by an opportunity for guests and delegates to mingle socially and get up close and personal the cute and intimidating indigenous fauna of the top end at Crocosaurus Cove. Working sessions took place at the Crowne Plaza Hotel, directed to the concept of “Engaging with Asia”. Ten presentations were delivered over two days by a group of prominent speakers and each day closed with an interactive Forum session which encouraged frank and forthright discussion. The social culmination of the Conference was undoubtedly the “black tie” dinner held in the magnificent setting of Pee Wee’s at the Point, a venue renowned for its outstanding views across the bay towards Darwin. As the enchanting twilight of the tropics faded, guests were welcomed by the Chairman of the Conference, Joseph Lukaitis and were given a short history of the origins of the College by Professor Phillip Hamilton. The guest of honour and guest speaker at the Dinner was The Honourable Justice Dean Mildren, RFD, and Senior Puisne Judge of the Supreme Court of the Northern Territory who warmed to his theme of “Notorious and Notable Notaries”. His Honour amused guests with his gift of alliteration and judicious humour and graciously accepted an Honorary Fellowship of the College from the Chairman of the Conference, Joseph Lukaitis. The closing highlight was the bestowal, by unanimous vote of the Board of Governors, of a rare Distinguished Fellowship of the College on Professor Peter Zablud for his; “outstanding service to the College and significant contribution to the Australian, New Zealand and international notariats“. The Conference concluded with a warm invitation extended to all delegates by the Chairman of the Conference, Joseph Lukaitis, to attend the next Conference of the Australian and New Zealand College of Notaries in Hawaii in 2014. The College set a precedent for other common law notariats to follow when it held its annual Conference in Bologna, Italy on 1, 2 and 3 September 2011. From the formal Conference Opening in Bologna’s magnificent Stabat Mater hall, to the working sessions conducted at the five star Grand Hotel Majestic, to the Conference Dinner held in the Palazzo Fava, the Conference has been praised by delegates and guests alike as an unforgettable event and an outstanding success. 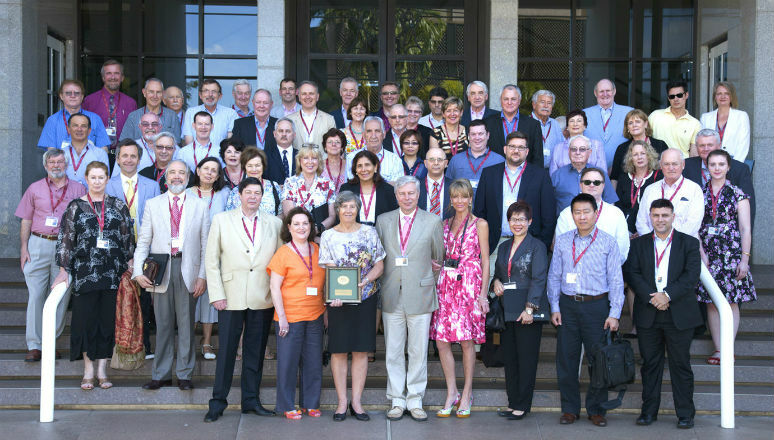 Notaries from British Columbia, England, Germany, Hong Kong and Portugal joined the members of the College, who had travelled to Italy from Australia and New Zealand. In all, 95 delegates and guests attended the Conference. The College was honoured by the presence of the Deputy Secretary General of the Hague Conference on Private International Law, Dr. Christophe Bernasconi FANZCN (Hon), the new CCNI President, Mr. Michel Merlotti, the President of the World Organisation of Notaries, Mr. Ken Sherk and Professor Pietro Zanelli, representing the Council of Notaries of Bologna, all of whom addressed the Conference. Working sessions took place at the Grand Hotel Majestic conference facility, directed to the theme “Towards a Closer Understanding”. Eighteen presentations were delivered by a group of prominent speakers drawn from both common law and civil law jurisdictions. Throughout the sessions, it became increasingly apparent that the longstanding antipathy between many civil law and common law notaries is not only ill-founded and counter-productive, but is largely based upon a lack of knowledge by each tradition of the qualifications, functions and skills of the other. Most delegates came away from the conference convinced that as between common law and civil law notaries, there are in fact, far many more things in common than had previously been supposed. The social highlight of the Conference was undoubtedly the “black tie” dinner held at Bologna’s recently renovated Palazzo Fava – now a museum and art gallery. The former Deputy Prime Minister of Australia and now Ambassador to the Holy See, the Hon. Tim Fischer AC was the guest of honour and guest speaker at the Dinner. Against a stunning background of paintings and sculptures, his Excellency captivated the Dinner guests with his wit and charm. His Excellency has graciously agreed to accept an Honorary Fellowship of the College on completion of his tour of duty on Australia Day 2012. The Conference was held on 10, 11 & 12 September. It was sensational – most delegates said it was the best conference of any kind they had ever attended. Our special guest presenters were the First Secretary of the Hague Conference, Dr Christophe Bernasconi and marketing guru, Mr Daniele Lima. Under the overall chairmanship of Professor Peter Zablud, Justice Emilios Kyrou of the Supreme Court of Victoria, Justice Richard Tracey of the Federal Court of Australia and Professor Gerard Nash QC, Chairman of the JD Curriculum Committee of RMIT University, chaired the Conference working sessions. We were greatly honoured by the presence of the Chief Justice of Australia the Hon. Robert French at the Conference Dinner. His Honour’s after dinner speech was an absolute delight. At the Conference Dinner, the Chief Justice and Dr Bernasconi were both made Honorary Fellows of the College. The College’s first Conference and the first ever conference of Australian and New Zealand Notaries. We held our collective breath. We need not have worried. The Conference held at historic Old Parliament House on 25 and 26 October 2008 was a resounding success. Key note speakers included prominent New Zealand academic, Professor Noel Cox who presented an address on the future of the Australasian Notariat, and Anti Money Laundering expert Joy Geary who discussed the likely impact of the Anti Money Laundering and Anti Terrorist Financing legislation on the conduct of notarial practice. The Attorney General of Australia, the Hon. Robert McClelland MP was our special guest at the Conference Dinner. In his supplementary remarks to the official speech, the Attorney pledged the support of the Australian Government to the notariat and to the College. At the request of the Shadow Attorney General, Senator George Brandeis who attended the Dinner, the Attorney also committed the support of the Opposition. Following his speech, the Attorney was made an Honorary Fellow of the College. His Certificate was presented by the College’s distinguished patron and first Honorary Fellow, Professor John Harber Phillips AC, FANZCN (Hon), QC.